When you first load the game you will see the Gene Medic start screen. Press the first button (CTRL key) to start. Press the reset switch (F2) to reset the game. There is only one difficulty. The figure below summarizes the playfield of the game. The top two rows are the patient health (P) and expenses ($) score area. Each starts out as a dark brown color. The color of the score area becomes more yellow as the patient health improves and as the treatment expense increases. 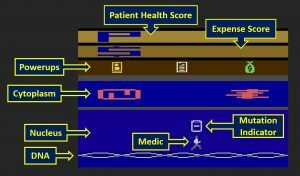 The next row below the scores is where the computer (left) for the electronic health record (EHR), the medical literature (middle), and health insurance payment (right) powerups appear. The area below the powerups is a virtual cell. The top grey line is the cell membrane and below that is the cytoplasm with mitochondria and endoplasmic reticulum organelles shown. Below the cytoplasm is the nuclear membrane and the nucleus with the patient’s DNA shown in yellow. The player can move left and right but can only advance to another screen to the right. As the player moves across the DNA strand a mutation indicator screen will appear above the player’s head when a mutation is encountered. Think of this as a smart device or tricorder. Once over a mutation the player will need to decide whether to edit it or not. Editing occurs when the joystick is pressed down while over a mutation. A tricorder with a “+” indicates that editing the mutation will help the patient. An “!” indicates the edit will harm the patient. A “-” indicates that it is unknown whether the edit will help or harm. This can be resolved by looking up the mutation edit effect in the medical literature. This is accomplished using the white literature powerup that appears in the middle of the brown powerup bar as shown above. Pressing the joystick up while the tricorder is present activates the powerup revealing the result of the possible edit. A “::” indicates that the mutation effect is context-dependent. This means that additional information about the patient is needed to know whether the edit will be harmful or helpful. The computer powerup provides access to the patient’s electronic health record (EHR) where the details of the mutation context (e.g. age, weight, smoking status) can be learned. This powerup is also activated by pushing the joystick up while the tricorder is present. The money bag powerup can be activated to provide additional resources for editing thus reducing the expenses score. This powerup can be activated from anywhere on the screen. The patient score starts out at “1” as represented by the color brown. This indicates a poor health status. The player continues editing mutations until the patient score advances to bright yellow (e.g. “9”) at which point the patient is cured and the game is won. A red heart will appear in the middle of the screen when the player wins the game. Decreasing the patient health below brown will results in the patient’s death and a loss for the player. Increasing the expenses to bright yellow before the patient is cured will also result in a loss. A loss is indicated by a grey heart appearing in the middle of the screen.